The topography of Ibaraki is mostly made up of flat agricultural plains that produce a quarter of Japan’s piman (bell peppers) and hakusai (Chinese cabbage). What the prefecture is less noted for is mountains, although it does sport Mt. Tsukuba (877 m) the shortest of the Hyaku-meizan. 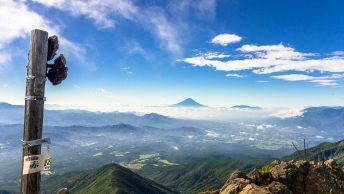 This hike focuses on the mountainous northernmost part of the prefecture bordering Fukushima Prefecture. Right off the bat this hike is not advisable as a day trip. Unless of course that is you’re a glutton for punishment and want to spend 11 hours travelling there and back. A more sensible approach is to spend a night in Mito and catch the first JR Suigun line train which corresponds with the first morning bus from Hitachi-Daigo Station 常陸大子駅 bound for Mt. Yamizo (36 mins, 810 yen). To get to Mito take a limited express Hitachi or Tokiwa from Tokyo Station. The next pro trip is not to undertake this hike in the middle of a heat wave though once we reached the first car park the light breeze did make it somewhat bearable. At the curiously named Jakechi 蛇穴 (snake hole) bus stop you can fill up your water bottles at a spring across the street. A little further up the road brings you to a torii gate and local guide map. Start heading up the road and after a couple hundred metres look for a trail veering off to the left (this isn’t the trail head, but a shortcut bypassing a section of road you’re walking). After hitting back onto the road continue for a bit and repeat this process with another shortcut which pops out near a parking area. Just past the car park you enter the trail proper. Much of the stunning woodland found on the slopes of Mt. Yamizo is old-growth forest including, Buna (Japanese beech), Dakekanba (Erman’s birch), Kaede (maple), Mizunara (Mongolian oak) as well as towering Sugi (cedar). After 20 minutes of hiking you come to the first of five natural springs. Kinsho-mizu 金性水 was little more than a trickle but was cool and refreshing to drink. The other springs we came across were mostly dry. Apart from a small washed out section of trail that necessitated a minor detour it is well maintained and easy to walk. After crossing the road the path steepens before you reach the Yamizomine Shrine and the summit of Mt. Yamizo 八溝山 (1,022 m). After taking your pics on top of Ibaraki’s highest peak head over to the rather incongruous observatory deck. In days past they used to sting you 100 yen for the privilege of climbing this castle like structure it but now thankfully it is free. In clear weather the panoramic views take in Mt. Bandai, Okunikko, Mt. Nasu, Mt. Tsukuba along with Mt. Fuji. The Tokyo Skytree is also possible to pick out in post typhoon like conditions. When you’re ready to head off, return to the road you crossed, turn left and follow it down to the Nichirin Temple 日輪寺. Along with some restrooms there is a small waterhole to cool off. From here the hike dips into a valley where we finally came across a few of the “ya-mizo” or eight ditches. These now abandoned ditches were once thriving wasabi fields that dotted along the crystal-clear stream. A short 10-minute climb brings you back up to the car park where you can retrace your steps back to the bus stop.